A blog about a fitter you. Come find out what is on the cutting edge of fitness science and be a part of the ongoing conversation. pjfit.com will stay here as my virtual “pamphlet” on the web, but I’m now using beegeandpeege.com for my new activity because through combining the marketing talents of Beege (aka Bev), and the content creation of Peege (me), we will be able to help way more people together than I can alone on this blog. If you are a subscriber to this blog, just go to beegeandpeege.com and subscribe there to get even betterer and fantasticer content than you ever did here, like new recipes, blog and vlog posts, and more! Why do I keep talking about rewiring the brain to achieve health and fitness? Because without that process, it’s HARD! Plus, any progress towards improved health and fitness is temporary at best. And then there’s the weight loss yo-yo that so many are familiar with. To solve all these problems, the brain must be rewired. This infographic below explains that process and how we help people at the X Gym to achieve their goals faster, easier and more permanently. To learn more about training your brain at the X Gym, just contact me through pj@xgym.com. Need to Break Out of a Crummy Mood? Label it! We all know how powerful gratitude is and have the advice, “Don’t worry, be happy,” but at times, that advice is certainly easier said than done. Sometimes it feels impossible to break out of a funk or negative state of mind, but there is hope – and even specific strategies as well! One of these is to train your brain to catch yourself in that emotion and then label it. Is it Fear? Anger? Sadness? Stress? Take a moment to find the closest label and then give it that label. The process of doing this pulls it out of the area of the brain that ruminates about the emotion, namely, the amygdala, and makes it worse. Then it goes into the area of the brain that can think of it logically and put it in true perspective, namely, the prefrontal cortex. In one study using brain scans, participants viewed pictures of people with varying emotional facial expressions. Researchers observed, each participant’s amygdala being activated to the emotions in the picture. But when they were asked to name the emotion, the logical and rational prefrontal cortex increased in activity and the emotional amygdala decreased in activity. In other words, consciously recognizing the emotions reduced their impact. 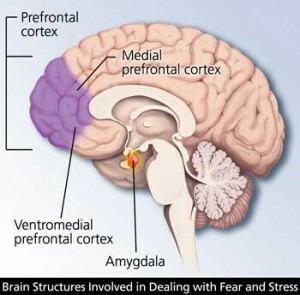 The brain has significant difficulty sending energy to more than one part of the brain simultaneously, so when you are consciously shunting energy to the prefrontal cortex, you are necessarily shunting it away from the amygdala. This not only makes you feel better at the time, but trains your brain to do this process more easily and subsequent efforts later. Try it out. You will be surprised how easily a simple thing like naming your mood or emotion can help you escape that state and even prevent associated behaviors like emotional eating!